The TwoPlusTwo forum is probably the biggest poker forum on the internet with over 20 million posts in their archives. For a new visitor to the site all the content on twoplustwo might be a bit overwhelming, but if you push through you’ll find a treasure of information. 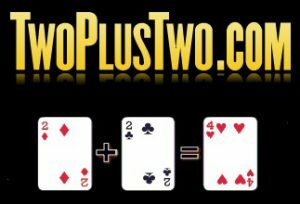 TwoPlusTwo is probably one of the first poker forums on the internet and was started by old school poker pro David Sklansky. He’s one of the most respected authors when i comes to writing poker strategy books. You can find a review of The Theory of Poker, which is probably his best book, on our site. Besides Publishing books written by David Sklansky, TwoPlusTwo Plushing also brings out the highly recommended books writen by Dan Mason, Dan Harrington and many others. Since the launch of the TwoPlusTwo forum it has become home to over 200,000 poker players seeking to discuss in depth poker strategy with each other. Besides strategy it’s also a very good place to find some of the latest poker gossip and the newest community legends (when for instance someone decides to post their hand histories of a 48 hour session, starting with $10 and ending the session with over $40.000). Another cool feature TwoPlusTwo provides is their weekly 2+2 pokercast (pod cast), presented by PokerStars. They talk about the latest buzz in the poker industry and with different guests appearing every week it makes an average online poker session a lot more entertaining.